We have 2 runners on Friday starting with stable star Fort Jefferson at our local track Bangor on Dee, he has been fantastic for the yard since we purchased him out of the Andrew Balding yard. 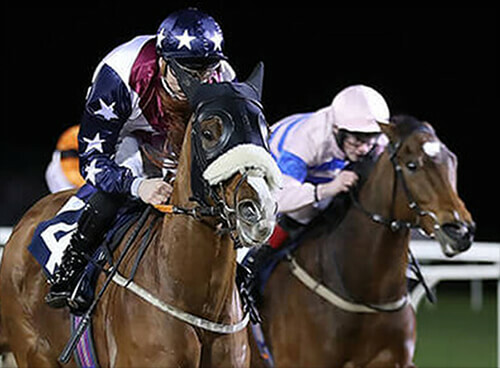 He started his winning at this track when victorious in a maiden hurdle in May before winning twice back on the flat in June, Royal Ascot proved a step too far but he is in good order again at home and should be thereabouts at the finish. Its great to have Harry Skelton aboard as he was when he last won at the track. Our intentions then move to the evening meeting at Wolverhampton where Mi Laddo will be looking to build on his debut at Haydock, he was very green that day and whilst he will probably come in to his own next year hopefully he can improve slightly from that effort. We are pleased to have been able to book Pat Cosgrave to ride as he should be able to give us good feedback.